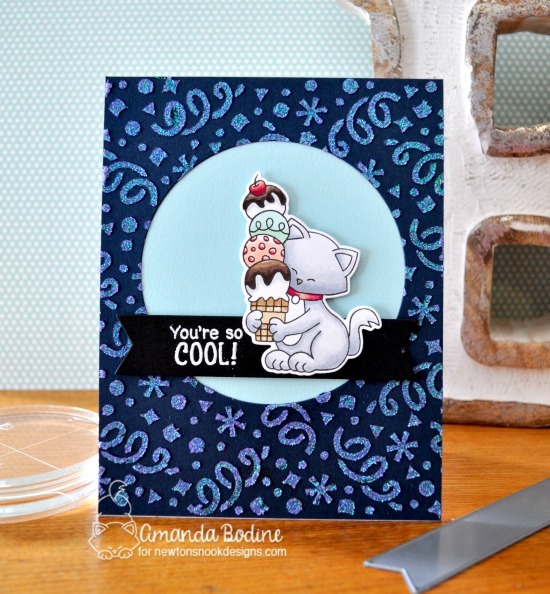 Stay cool with this adorable card by Amanda today! She used that cute kitty with ice cream from our new Newton's Summer Treats Stamp Set as the focus of her card. She colored the kitty with copics and cut him out using the coordinating Newton's Summer Treats Die Set. Then she added the sentiment, you're so cool, also from the Newton's Summer Treats Stamp Set and embossed it in white on a black flag that was cut out using our Frames & Flags Die Set. For her card base she used our Confetti Stencil to create that fun glittery blue background! What a perfect card for a birthday or just for summer fun!